The term Deepavali or Diwali means "a row of lights" in Sanskrit and is celebrated as the festival of lights throughout India. Deepavali is normally observed for three days- The Dhanteras marks the beginning of this festival while Narak Chaudas and Diwali is celebrated in the second and third day respectively. In Kerala, Deepavali is observed on the preceding day of the New Moon in the Malayalam month of Thulam i.e. October-November. However Deepavali is not a major festival in Kerala and is celebrated with great enthusiasm by the Hindus, Tamil, Bengali and other different North Indian Communities who reside in Kerala. Goddess Lakshmi, the goddess of prosperity is worshipped during this Deepavali festival. There are many mythological stories related to this festival of lights. Some belive that Deepavali is the celebration of God Sree Krishna's triumph over the demon Narakasura while some others believe that it was the great celebration relating to the return of Shree Ram from his exile. However the legend of Shree Krishna is more widely accepted in Kerala. According to this legend, an evil demon called Narakasura who ruled the kingdom of Pradyoshapuram, seized and imprisoned the women and tormented the people ruthlessly. Lord Krishna put an end to this evil act by destroying this devil. Deepavali was celebrated the day this tyrant died and the residents of Dwaraka welcomed Lord Krishna with illuminated lamps or diyas. From that time this lighting of Diyas or lamps on the dark Chaturdasi night has become a significant part of this festival. 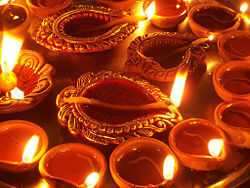 Hence Deepavali or Diwali is called the Festival of Lights. The Deepavali celebrations starts right from the early morning by taking a ritual oil bath before sunrise. It is the common custom in South India to eat a preparation of jaggery and dry ginger immediately after taking the oil bath. Dry ginger and jaggery serve as the Nivedya (offering) for Dhanwantari, who was one of the greatest exponents of Ayurveda. The Dhanwantari Jayanthi falls on the eve of Deepavali. The separate observance of this day had come to an end and enjoying the preparation of dry ginger and jaggery fallen to succeeding day namely Deepavali. Then they drape themselves in new clothes. The festivity starts by distributing special sweets, bursting of crackers and a wide assortment of colorful fireworks. The houses are beautifully decorated with clay oil lamps and the city dazzles with these sparkling lights. Deepavali may have deeper significance than what is popularly believed. At the time of the festival the sun is in the house of Thulam (Libra ie. the scales) which signifies commerce, and hence the association of Deepavali with merchants and the Goddess of wealth. The darkness and light symbolise ignorance and knowledge respectively. As the light dispels darkness, ignorance is replaced by knowledge. There is a prayer in the Upanishat. 'Thamaso ma Jyothirgamaya' ie. "Carry us from the darkness to light" some people are of the opinion that Deepavali, the festival of lights, symbolises this prayer.